Join us in the 2019 Phoenix Pride Parade! 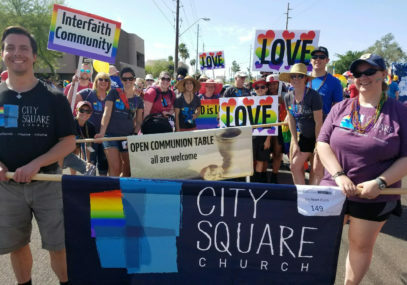 City Square Church proudly participates in the Phoenix Pride Parade every year. Instead of our regular Sunday Service at Primera Iglesia on Sunday, April 7th, we will meet at 9:30 AM at 3rd Street and Windsor Ave (south of Thomas) and be in the Phoenix Pride Parade. The parade starts at 10AM with check-in from 8-9:30AM. The parade route ends at Steele Indian School Park. If you drive, you may want to start the day at the Camelback Park and Ride and take the light rail to Thomas. Then when the parade concludes, you can take the light rail back to your vehicle. If you live along the light rail route, the light rail is convenient for that day. Join us the Thursday before Phoenix Pride for #ChurchOut at Boycott Bar, a citywide open mic night expressing the sorrows and celebrating the joys of being LGBTQ+ in a church or religious community. Calling all LGBTQ+ musicians, dancers, poets, storytellers, comedians and other artists interested in sharing their story or expression about coming out in the church or religious community. Coming out as gay, lesbian, bisexual, transgender, queer or allied takes bravery, and it takes even more bravery when coming out in the religious community! 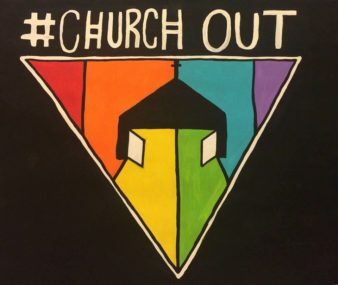 In partnership with the Human Rights Campaign, we’re hosting #ChurchOut, a citywide open expression celebration for the 30th anniversary of National Coming Out Day, 6:30pm, Thursday, October 11, at Boycott Bar! Calling all LGBTQ and ally musicians, dancers, poets, storytellers, comedians, and any other artists interested in sharing at the celebration. Get there early to sign up on the performers’ list. October is National Coming Out month. So what does coming out look like in Phoenix today? Ashton and Janine Skinner will lead an interactive exercise highlighting the experiences of so many of our neighbors, coworkers, and church members. Come hear, reflect, and share your thoughts about how we as a community might be called to respond! Join us for a Palm Sunday Potluck at Primera. 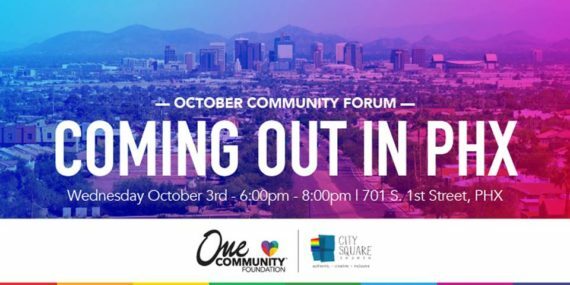 Janine and Ashton Skinner from One Community will be here to talk with us about what they do and how City Square can partner with them for the next quarter.